On the one hand, the Undead seemed uninterested in attacking the town’s twin fortresses where most of the population was sheltered. On the other, an entire company of garish, inhuman creatures was butchering the Daqan legion, as a terrifying, screeching Undead dragon, whose very breath could sicken a seasoned fighter, circled above the fray. The worst part was that for some reason, whenever the Daqan approached the river, the Undead somehow became even more lethally vicious. 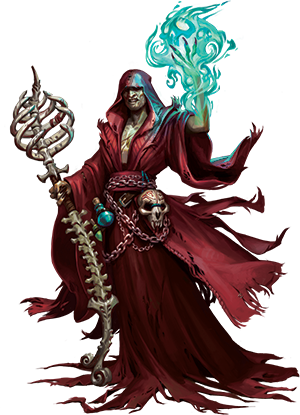 Invade the realms of the living and or lure them into unhallowed ground with Terrors of the Mists and Heralds of Dreadfall, the upcoming Undead Army Pack expansions for BattleLore Second Edition. In each Army Pack you’ll find five never-before-seen types of units and everything you need to muster a complete army of Undead, from lore cards and terrain tiles to detailed, sculpted plastic figures. Whether you prefer to charge straight into enemy territory, lie in wait for them to come to you, or send out small, swift strike forces, you’ll find tantalizing tactical possibilities in the new Undead faction. 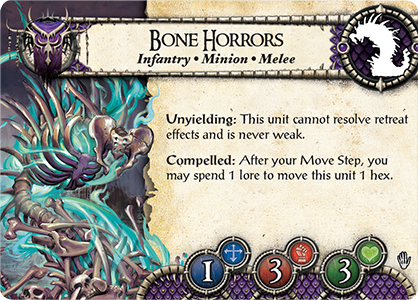 Today’s preview introduces a few of the Undead faction’s scenarios, both offensive and defensive. 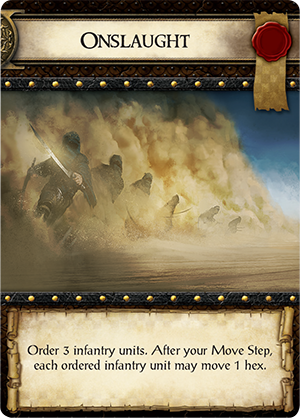 In addition, for the first time, we’ll focus on how units from both Army Packs can work together. Once you have the entire Undead faction at your command, you’ll be able to both fully exploit the scenarios you choose and frustrate your opponent’s battle plans. For centuries the army of Undead kept away from civilization, lurking in graveyards, barrows, and bogs, gathering strength, and waiting for the right time to attack. The Undead never intended to meet the living on neutral ground. They always knew that the first step in conquering Terrinoth would be to launch an invasion, to charge towards the heart of the realm and lay waste to anything they encountered along the way. More than any other scenario, The Culling scenario of Heralds of Dreadfall brings to life that invasion. It invites you to place an Undead banner marker inside your opponents territory. 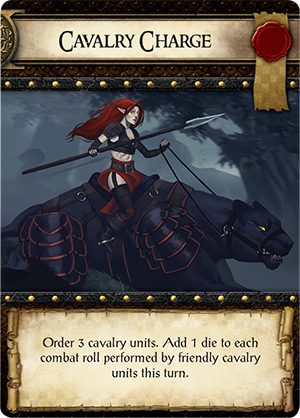 To facilitate your charge, it also grants you the ability to spend lore to recover used Command cards, so that you can play Surround , Onslaught , or Cavalry Charge as often as you need to break through enemy lines. The Culling charges you not only to invade enemy lines, but to occupy two banners—at least. Therefore, you’ll need a diverse force that can forcefully take a position and defend it well. 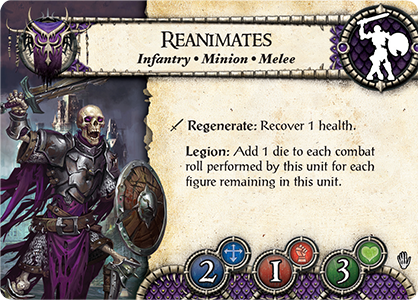 A large group of Reanimates can move quickly and cover a large amount of territory, and the fact that they can regenerate makes Reanimates units difficult to eliminate. Then, you might deploy Barghests alongside them. 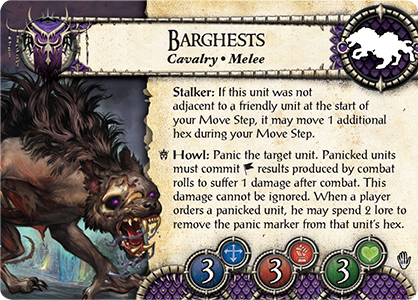 These lupine creatures from Terrors of the Mists are a fast-moving cavalry unit thats can stalk the enemy and push them away from strategic locations. 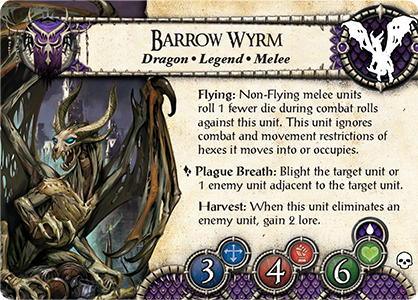 Finally, the Barrow Wyrm can soar over the battlefield, descending only to attack. The lore it harvests from eliminated units can then fuel your manipulations of the Command deck. 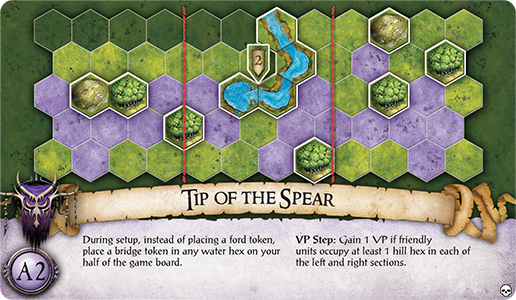 By contrast, Tip of the Spear , found in Heralds of Dreadfall, is a defensive scenario that rewards you for controlling a river-bounded hex near the center of the board as well as the distant high ground on either side. 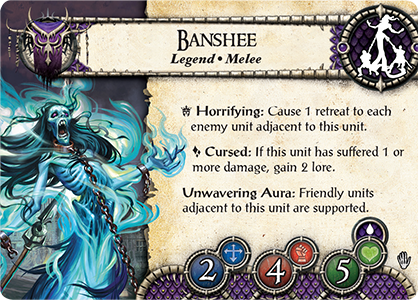 The Banshee of Terrors of the Mists is well-suited for occupying that key central hex. Her results force enemy units to retreat, while her Unwavering Aura supports adjacent friendly units, enabling you to encircle her with a defensive blockade of infantry or archers. 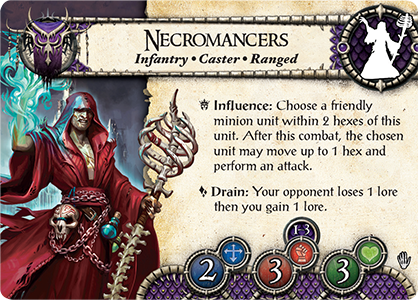 A pair of Necromancers units might occupy the hills, where the powerful ranged attacks of these Caster units can reach distant targets and their influence can grant additional movement and attacks to nearby Reanimates and Bone Horrors . The arrows of Skeleton Archers and the breath of the Barrow Wyrm can Blight enemy units, weakening them and hindering their movement. But the debilitating taint of Undeath is so strong that it can transform the landscape. 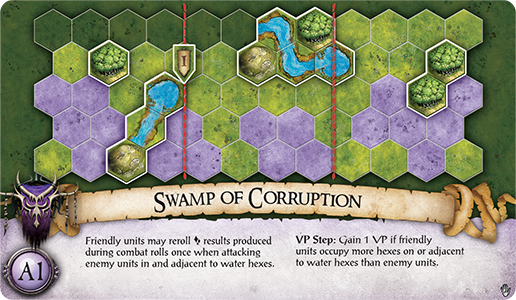 In the Terrors of the Mists scenario, Swamp of Corruption , all the water on the battlefield allies itself with the Undead, becoming dangerous for living enemies to approach. Friendly units gain the ability to reroll when in or near water, and victory points offer an incentive to eliminate enemy units who approach any corrupted rivers or ponds. This scenario allows you to explore the abilities of the Death Knights, Wraiths , and Skeleton Archers of Heralds of Dreadfall to the fullest. 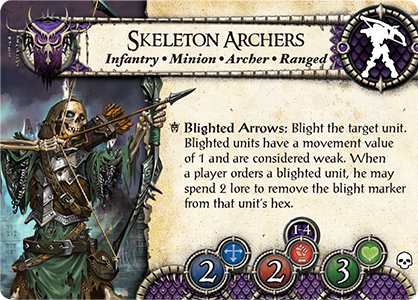 The Skeleton Archers, with a combat value of two, have much to gain from being able to reroll a dice result. They can take aim at distant enemies while occupying a water hex. 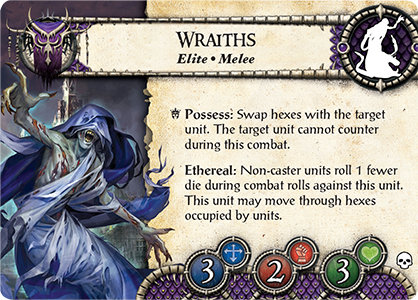 Wraiths also have a combat value of two, but since they are ethereal, only Caster units can roll their full value of combat dice against them, and the Wraiths can move through other units to reach the tainted water. Death Knights, finally, can ride up and down along the water, pin enemy units in place with a result, and because they're unassaible to weakened units, they can easily eliminate enemy units without fearing attack. 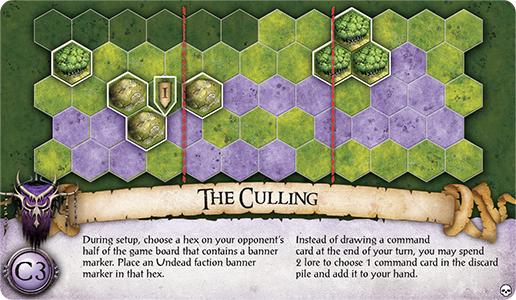 Both Undead Army Packs introduce a new kind of terrain: the graveyard hex. With a graveyard hex in play in any scenario, you can spend lore when one of your Minion units is eliminated to immediately bring that unit back to life on an unoccupied graveyard hex. Then, you must remove the graveyard from the board. 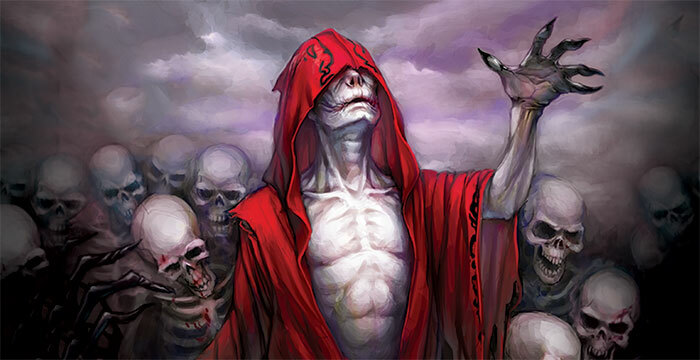 In Dark Ritual , a scenario from Terrors of the Mists, graveyard hexes take on even greater power. 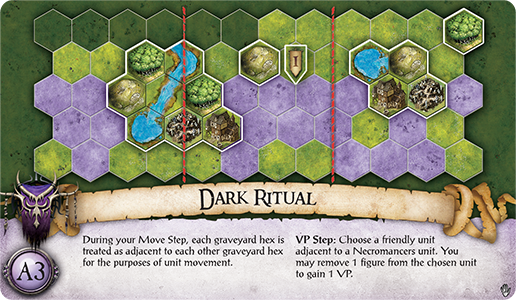 Although seven hexes apart, you can move between the scenario’s twin graveyards as if they were adjacent. Dark Ritual also offers victory points as a reward for sacrificing your own forces. 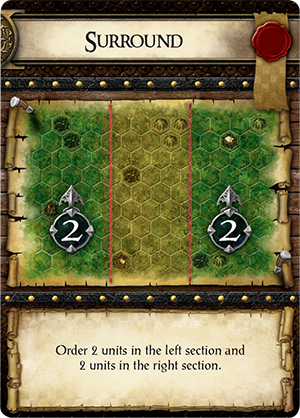 By removing one figure from any of your units adjacent to a unit of Necromancers, you can earn a victory point. This diabolical practice won’t enable you to win the game, but might turn a hard-fought tie into a clear victory. Not even the parched, blood-stained territory of the Uthuk Y’llan is as perilous and foul as the regions haunted by the Undead. And while other factions have the ability to shape the battlefield to their own ends with barricades, only the Undead can corrupt the very waters of the land. It is no wonder that their invasion has struck fear in the hearts of the people of Terrinoth. The Undead will launch their foul invasion soon. Pre-order Terrors of the Mists and Heralds of Dreadfall from your local retailer today!